I am home alone and marginally depressed. It is Bank Holiday Monday and it hasn’t stopped pouring with rain all day. My children left this morning to go on holiday to Greece with their father and his new family. I forgot to make a plan for myself in the meantime. I did slightly think that by now I would be over the silence and the misery of having my children out of the house. I thought I might revel in the calm solitude given that for the last week I’ve been disturbed by marauding teenagers coming back at all hours of the day and night. But clearly this is not the case and it feels wrong. Even after all this time I still wonder how I got to be here. A single mother, home alone. I have already resorted to comfort, foraging behaviour. 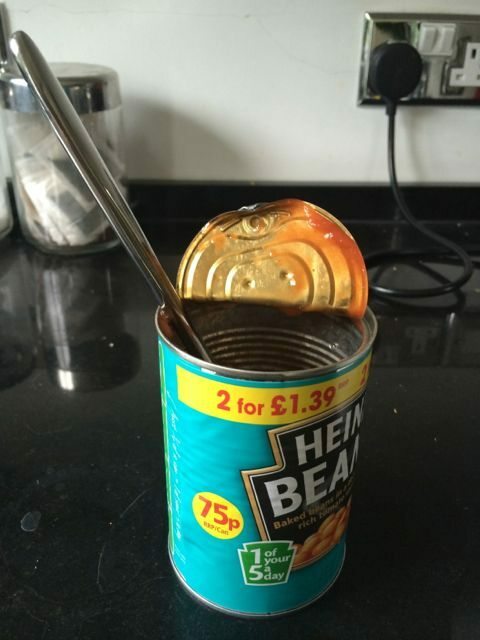 Lunch was cold baked beans out of a tin. This is not a good start to my plan to treat myself to a few luxury home cooked meals. Why does it still hurt? To not be with my children? To know that they are going to have a lovely time without me? They’re older now and can go away on their own anyway. But it’s not the same. It’s the acceptance of change in the family group. My family is the me and the three of them now. Whereas this week they are with a very different family group consisting of their father, step mother and step brothers. Why did I not plan my summer better and make a space to go away with all of them? Instead, I’ve had a lovely time with them all separately – mainly based on the fact that I massively over-spent last year on a holiday for the four of us in Italy. This year, their father was going to take them somewhere lovely so I decided that they didn’t need two holidays abroad. My daughter was already going to Ayia Napa with all her friends, my son went to Croatia with his girlfriend and even my youngest is currently eating mangos in Thailand. Instead I spent four days with my daughter in France, five days with my youngest in Spain and for the same amount of money I took my oldest to see “The Curious Incident Of The Dog In The Night Time.” Why are theatre visits so expensive these days? But still, I am now pining for my children who are all out of the country without me. They will be having an amazing tine with their step family but the reality for me, sadly, is that it doesn’t really get any better. This divided life. Maybe it’s because I don’t have my own blended family to be with. Maybe I should have realised that I’m still not grown up enough to enjoy the peace and quiet and should have made plans to go away myself, because the fact is that I still don’t cope well with my own company and of course I’m jealous of their holiday plans and want to be there with them. I was invited to go away with friends but decided that I’d be better spending the time at home and anyway, I’ve got to save money to buy all the gear my daughter needs for university now. I thought I’d be fine staying in my house on my own. Going to work and chilling in the evenings. I envisaged myself walking into a calm and peaceful environment, but instead it’s deadly quiet and I don’t like it. Especially when I have to face up to the reality with my daughter going to university in a few weeks that my child rearing years are nearly over, however much they choose to come back and a new phase is about to begin. Where did all that time go? I need to sort out my new world order and fast. Or get used to it. Keep busy. Make plans. Not sure how to do that.